Paul Gundry, The Source (Mt Field), 2018. 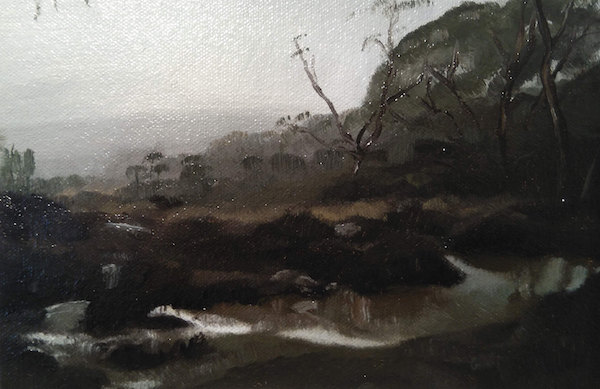 Oil on canvas, 12 x 17cm. Courtesy: the artist and Colville Gallery, Hobart. Reflections seeks to de-mystify light and dark in the wilderness where the immediacy and essence takes us to the heart of modern painting. It aims to reconnect with and renew the lessons of the painters that were so deeply involved with the question of painting at the forefront of the modern era and plein air painting – Corot and the Barbizon school, Daumier, American tonalism, as well as the Australian Tonalists, such as Clarice Beckett. A common element of these various modern schools is a reductive tendency. Something of this tendency is captured in many of the attempts to explain form in modern painting, for example: “The eye creates its world not by minute observations, but by swift interpretations of the more significant indications of mass. Resolve form into its constructive planes” from Mather: A Study in Tendencies. Paul Gundry has completed Bachelor of Art and Bachelor of Fine Arts and takes serious consideration of reference in his approach and studio practice. His painterly work has gained inclusion in major national awards including the Tasmanian Art Award 2008 Winner, the Glover 2008, 2010, 2014 & 2017, Hadley’s, Lloyd Rees, Paddington, Mossman and Hutchins Art Awards.